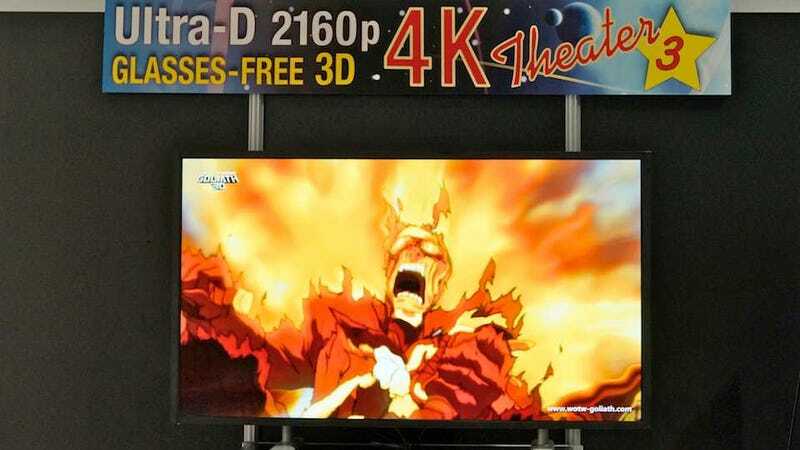 CES 2013: The year Ultra HD turned into the pipe dream of the future to the present reality you can't afford. Now that UHD TVs are about to hit the market, manufacturers are, of course, showing off 4K concepts like this glasses-free 3D 4K panel from Stream TV Networks, which you will be able to drool and dream about but never ever ever ever buy. The panel is actually monumentally impressive, displaying some of the most eye-popping glasses-free 3D we've ever seen. The effect worked dead-on, but what was really surprising was that the 4K panel worked at multiple viewing angles. It's also impressive that the 3D content was scaled to 4K without any apparent loss in quality. Now, if only this would ever exist. Companies have been showing off glasses-free 3D forever and we've never seen a real world product. Oh well, it wouldn't be CES without some quality vapor.